Doug Parker is the director of the California Institute for Water Resources and Strategic Initiative Leader for UC Agriculture and Natural Resources' Water Quality, Quantity, and Security Strategic Initiative. I interviewed him as we celebrate the 60th anniversary of the water institute. Can you explain what the California Institute for Water Resources is? It's a bit of complicated, but fun, history. In 1956, the state legislature passed a bill to allocate $100,000 to the University of California to create an institute that would help solve water issues facing California. A year later, those funds were matched by the university, which established a multi-campus research unit that became the UC Water Resources Center. It was originally housed at UCLA and directed by Dr. Martin Huberty. Over the years, it moved between the UC Berkeley, UC Davis, and UC Riverside campuses. It has been a part of UC Agriculture and Natural Resources (UC ANR) during most of this time. We are now located at UC ANR's headquarters in Oakland. The institute has been directed by academics across the University of California system, beginning with Martin Huberty in the 1950’s, John Letey in the 1990’s, and Doug Parker today. To complicate the picture a bit, in 1964, Congress passed the Water Resources Research Act, creating a nationwide system of institutes. California designated the UC Water Resources Center as its representative institute. Today there are 54 institutes at universities in every state, the District of Columbia, Guam, Puerto Rico, and the U.S. Virgin Islands. This national network, collectively known as the National Institutes for Water Resources, is overseen by the U.S. Geological Survey. That history brings us to today. The center was renamed the California Institute for Water Resources in 2011, when I became the director. The initial mission of the institute still stands: to integrate California's research, extension, and education programs to develop research-based solutions to water resource challenges. In practice, we work across all kinds of institutions and provide educational programs through direct contact, web-based programs, and social media to increase understanding of complex water issues while also trying to diversify the conversation about water within our state. At this point, we are a small institute. I wear multiple hats, including as the leader of the UC ANR water strategic initiative. You [Faith Kearns] have multiple roles, including leading our online science engagement efforts, and Juan Zavala works with us on administrative and budget needs. We are really lucky to have support with things like meeting arrangements from UC ANR, as well as to work with researchers across the UC system and beyond. The water landscape, so to speak, in California is crowded. How does CIWR fit into the larger ecosystem of academic and other water institutions in the state? Our role as the California institute in this nationwide system of water institutes is to increase cooperation and collaboration among all academic institutions working on water across the state. Nearly every UC campus, as well as several CSU campuses and private universities, has an institute or center working on California water issues. In addition, individual academics often work on water issues outside any formal affiliation with a water institute. Our role is to help connect those efforts where appropriate. In addition, we work to amplify voices and help ensure the great research and extension happening at all our institutions makes its way to the rest of the state where it can benefit water management. The institute supports a wide range of projects by early career faculty across the state’s academic institutions. As an example, we use our federal budget allocation from USGS to administer a competitive grants program. The program is open to new academic appointees at any university or college in California. We support between five and eight projects on two-year cycles at up to $15,000 per year, on topics ranging from agricultural groundwater recharge to intermittent stream biology to water policy. We feel that by using our limited funds to support new or junior faculty, we are increasing the diversity of projects and voices in California water. We also oversee the Rosenberg International Forum on Water Policy – its overarching theme is reducing conflict in water resource management. Interactive discussions about water management are at the heart of the forum, which is held every other year in different locations around the world. In addition, we hope to directly impact California water issues through our own research and extension programs. For example, we created a series of drought tips, supported by the California Department of Water Resources, to help farmers and homeowners adapt to drought. We have also worked with a group of UC, state agency, and industry scientists to develop and deliver curricula on fertilizer and water management to lessen nitrate pollution, a project supported by the California Department of Food and Agriculture. In addition, we have sponsored or cosponsored many events on drought and water management. We created a series of online seminars on water management issues ranging from groundwater to livestock to wildlife management. We stay in touch with our partners through our website, newsletter, blog, and Twitter feed. We actively use social media to contribute, shape, and diversify the conversation on California water issues. What are some of the key water issues that you see ahead for state and how will CIWR contribute to solutions? California will always face a variety of water issues from drought to climate change to flood control. In the short-term, I think the state is on a path to better manage both groundwater quality and supplies. Over the next five years, these two aspects of groundwater management need to be jointly addressed. We currently have two parallel management programs: the quality-focused Irrigated Lands Regulatory Program and the supply-focused Sustainable Groundwater Management Act. It is my hope that the scientific community can assist the state in managing these programs jointly so that they do not have competing goals. Groundwater will continue to be a big issue for California. 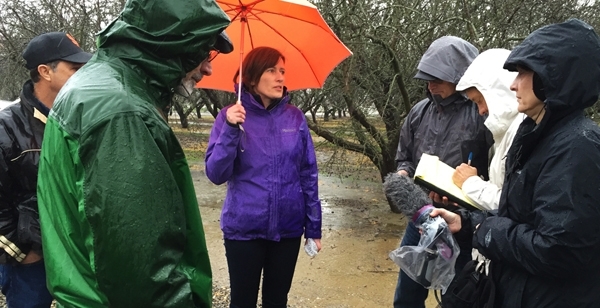 Here, Helen Dalhke, CIWR Affiliate and UC Davis professor, talks with journalists about her groundwater recharge research. Another key issue will be management of surface water supplies in a changing environment. Snowpack currently provides nearly one-third of California's freshwater supply. Climate change models predict snowpack will decline by approximately one-third. We need to look closely at how we manage surface water – and groundwater – to account for these changes. Right now, we are about halfway through a strategic planning process to help us determine our efforts for our next 5-10 years. One aspect of that plan will be an effort to assess how the institute, along with its many partners, can help California specifically respond to these water management challenges. Stay tuned.